Liz and her husband Tom are semi-retired “academics” that have a very comfortable home in the just north of the University District in Seattle. Both Liz and Tom love the light that comes in the large picture window in the front of the house. 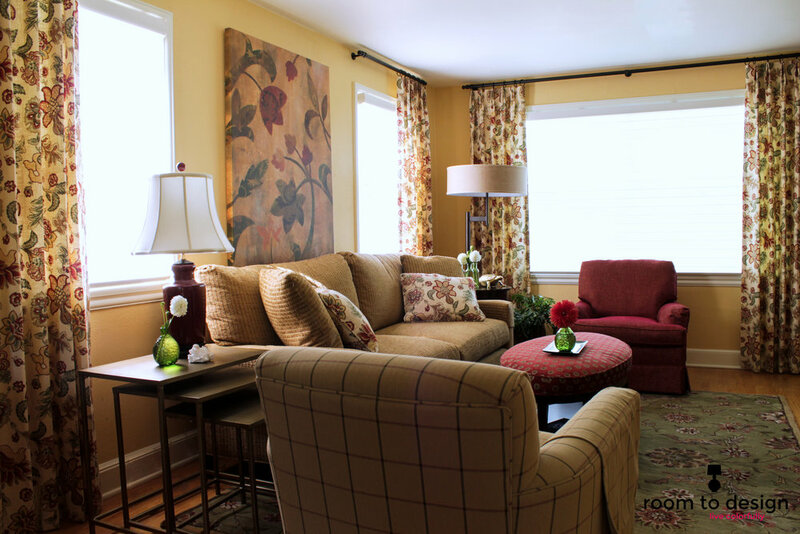 They also love a home that feels welcoming and cozy, but at the same time is well thought out and looks finished. The first thing Liz said to me when we started working together was, “I’m not a drapery person.” As a resident here in the sometimes (ok, often, especially in fall and winter) gloomy Pacific Northwest, I fully understand the tendency to embrace the naked window…how dare you block even an inch of that precious light?! But having seen the warmth and coziness, not to mention complete transformation window treatments can make in a space, I am here to advocate for draperies. Let’s make this clear. I’m not talking about your grandma’s balloon valances or lace curtains that can date a room faster than an 1980’s Nagle print. Nor will I ever specify a jabot or window scarf, these are better left in the era that gave us big hair and Boy George. The window treatments I’m talking about are simple and updated, two prong pleat or grommet panels that add softeness, pattern and texture and can really frame a view. There is actually a psychological connection between your brain and pleated fabric on your windows or fabric anywhere in your home, for that matter. Fabric is art, fabric is color, fabric is warm, cozy, comforting. By placing this textile artwork around your room, including your windows, you create a welcoming, finished space where you and your family will want to spend time. Back to Liz and Tom...I told Liz that I would respect her "non-drapery" stance, but I would show her two drawings; one with beautiful custom draperies and one without. She could decide which she liked best. Which space do you think she picked? Well, actually, she was still wanting to go with the no drape version…but then Tom weighed in. He liked the finished look the draperies gave the room. When I pointed out the fact the drapes would also help to balance the room that was slightly off center, she warmed up a little bit to the idea. Then, after seeing how all the fabrics worked together, she was still skeptical but she (with some nudging from Tom) decided to go for it. Liz called me the other day to tell me how she loves to just sit in the room and take it all in. She says she loves the way the draperies are the perfect frame for the view of her beautiful mountain ash tree outside the front window. She and Tom are spending a lot of time in a room that had previously been a pass through and an afterthought. I realize we did a lot more than just put drapes in their living room. 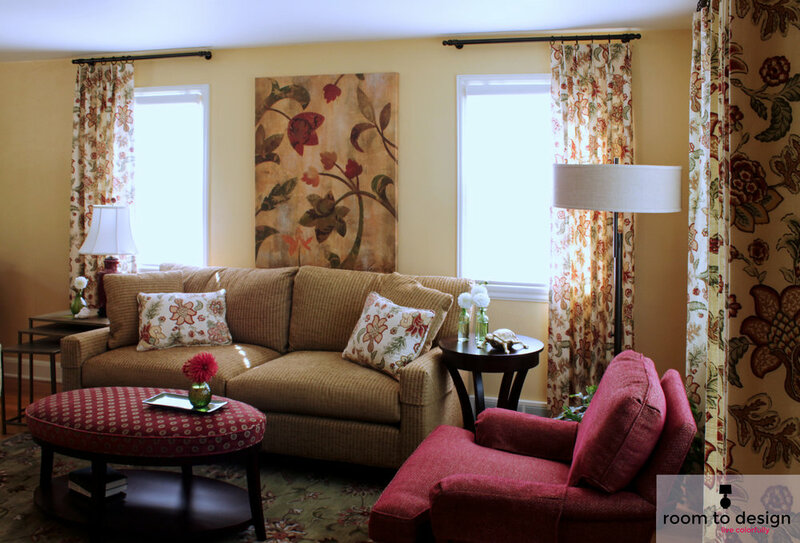 With a new sofa and ottoman, newly reupholstered chairs, new lighting and side tables, the room is transformed. But I must say, and I think Liz and Tom would agree, the window treatments complete the room. Leave your opinion in the comments. If you need to complete or start making your space as beautiful as Liz and Tom's, drop me a line.